Last week, post-holiday, when I was spending much of my time scrambling in and out of the washing machine I distracted myself by thinking of ways to recapture the holiday feeling at home. Even though most holidays are no longer than a fortnight, isn't it amazing how quickly you fall into new routines? And how many of them revolve around food? One such ritual (I won't say treat because it happened every day) was fresh croissants, baguettes and jam or Nutella for breakfast. I did try to balance this with an occasional pot of exquisite plain French yoghurt, just so you know. Moderating the amount of Nutella was strictly off limits though and we got through... let's say... more than one jar. Now unlike my teenagers, I'm not a huge fan of Nutella on its own but a delight I did discover in the supermarket was palmier biscuits; quite plain in flavour but very light, crisp and sugary. I also spotted some home baked versions (including super sized ones) in the bakeries and that inspired me to have a go at home. So to cut a long story short, I decided to combine these two holiday treats and make Nutella palmiers at the weekend. Making them was fun, quick and easy and would be a great way to keep young children busy in the school holidays if you are running out of entertainment ideas. I have made savoury palmiers before but not sweet ones and these are infinitely yummier. 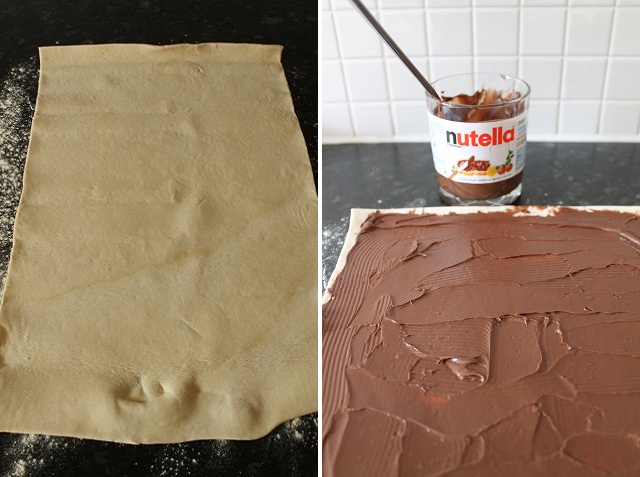 First unroll your pastry sheet and spread a thin layer of Nutella across the pastry (if you don't keep your Nutella in the fridge it should be quite spreadable). Mark the centre of the sheet and then roll it tightly from one end towards the centre and then repeat from the opposite end. Wrap in cling film and place in the freezer for about 10 minutes (to make slicing easier). Unwrap from the freezer and with the underside (flat surface, not the curled part) on top, slice quite thinly (about one third of an inch). Place on a baking sheet lined with parchment paper leaving plenty of room for expansion (I used two trays). Slightly separate the centre into a 'v' to produce a heart-like shape. Brush lightly with melted butter and and a light dust of sugar. Place in the centre of the oven. Check after 10 minutes - they may need just a little longer if not golden yet. Leave to cool slightly on the tray as the Nutella can be very hot. Cool afterwards on a wire tray - although they are best eaten when still slightly warm. Can be stored in an airtight container for a few days but they may not last that long. Enjoy with a cup of tea or a chocolat chaud. As you may gather I'm still in holiday mode, linguistically at least. Looks yummy and fun ...I am off to the supermarket to get ingredients ! Thank you .. PS love your warm tea cozy. They look delicious. Thanks for sharing the recipe. My daughter would love these, I will have to make them next time she is at home. Just purchased large jar of Nutella at bargain price in Aldi so keen to try these - they look delicious. Easy and delicious. You are right, this would be a great recipe for children to make. Those look delicious! My daughter loves to bake and loves Nutella so this would be a great recipe to try. The other day there was a jar of Nutella probably BIGGER THAN MY HEAD for sale at the local Costco. Since that jar would probably last just as long as a normal sized jar (Nutella doesn't last long in our house) I passed it by to the great disappointment of my daughter. Yummy! Love these simple to put together treats - could also be done with chopped pistachios, honey, etc! Also loving the teapot cosy - if home knitted, could we have the pattern? Sorry but my lovely teapot cosy was from Toast (extravagant, I know) and was a present from my brother who also bought me the teapot more than twenty years ago (hidden as it's very late 80s). If I was so skilled I would happily share :) Maybe someone could make a copy? Ooh these look yummy, I bought a jar of Nutella today so I will definitely give these a go. Thank you for sharing!